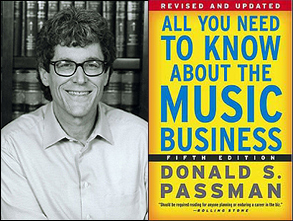 (CelebrityAccess News Service) – Renowned music industry lawyer, and author, Donald S. Passman will release the fifth edition of his highly acclaimed book "All You Need To Know About The Music Business" (Free Press) on October 20. This new version of the book covers the complex, rapidly-changing issues that are facing the music industry, including digital downloading and music piracy, the industry's strategies for dealing with these issues, the new "partnership" agreements where record companies seek to share in touring and other non-record income, plus what Passman describes as "foolishly reckless Predictions for the Future." The Harvard graduate, whose clients include Janet Jackson, Mariah Carey, Pink, R.E.M., Quincy Jones, Tom Waits, Randy Newman, Tina Turner and many others, writes about how rapidly the music industry is changing, and what can be done about it. business," says Passman, adding that the industry needs to figure out technological and business models to legitimize online music. "I think we are making some progress on that, but we obviously have a lot farther to go. We are also in a situation where the companies have become very corporate, which means they have to perform every fiscal quarter. In the past, companies could develop artists over several years, as opposed to the quick results they are forced to achieve these days." Originally published in 1991, "All You Need To Know About The Music Business" is widely considered the premiere textbook for anyone wanting to learn about the music industry. Organized in an easy-to-reference style, and infused with Passman's wit and personal anecdotes, the book covers all aspects of the music business. The book is broken down into nine parts: "Your Team Of Advisors," "Record Deals," "Songwriting and Music Publishing," "Group Issues," "Touring," "Merchandising," "Classical Music," "Music In The Digital Age" and "Motion Picture Music." · How royalties are computed in the digital age. · Music downloads and streaming. · Why the record companies are hemorrhaging money. · Industry strategies to combat piracy. · New laws of the electronic frontier, including copyright infringement, illegal downloads and challenges to intellectual property rights. · New "partnership" agreements where record companies seek to share in touring and other non-record income. In the completely revised "Music and New Technologies" chapter, Passman breaks down all the technological and legal issues into simple terms. He writes, "The current mess is a situation where a technology has outrun the intellectual property holder's rights to control their work," comparing today's situation to the legal backlashes that came about with the advent of VCR's, cable TV and photocopy machines. "To sum it up," Passman writes, "I think things are going to be rough until we figure out this new era, then I think they'll be better than ever. It's my sincere belief (some would say foolishly) that most people are honest, and given a legitimate, easy-to-use, high-quality alternative, they'll take it over piracy. At the moment, no such thing exists, but I'm optimistic we're moving in that direction." Passman is a member of the prestigious LA firm of Gang, Tyre, Ramer and Brown. He has also written two novels, "The Visionary" and "Mirage," and is currently working on his third. When he's not fighting for his clients or writing books, the father of four enjoys taking tests: he's a certified real estate broker, magician, dog obedience trainer and ham radio operator (seriously). Passman is involved in the community as well. He sits on the Music Industry board of The City of Hope; he's been a Trustee of the Artists' Rights Foundation; vice president for the Center for Early Education; and Federation Chief in the YMCA Indian Guides Program.